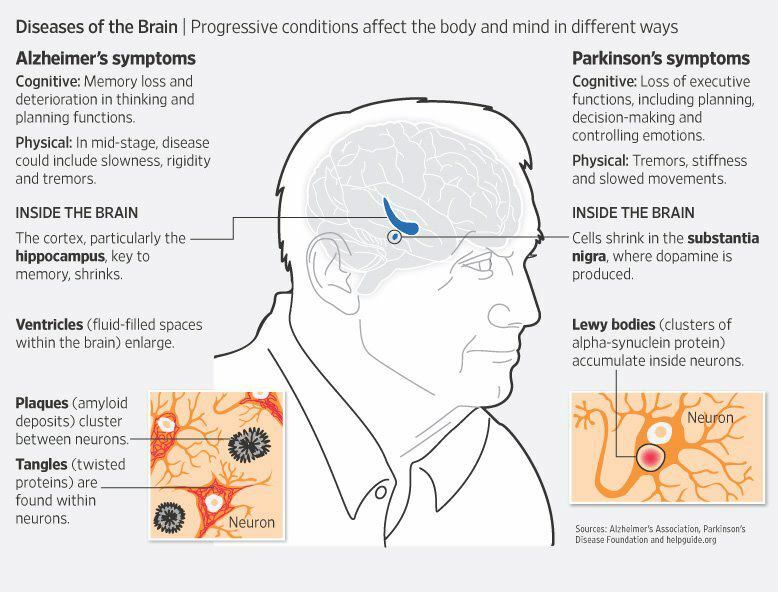 Parkinson’s disease… more than a movement disorder. Parkinson’s disease (PD) is more than a movement disorder. Dementia is one of the things people worry about. And a number of people with PD can develop cognitive changes. I want to stress these are DIFFERENT things. Dementia is a loss of intellectual function (memory, reason, problem solving, abstract reasoning) which is qualitatively different from a previous state of life. Dementia is chronic and progressive and impairs vocational/social function. *Remember the difference between dementia (the umbrella term) and Alzheimer’s disease (AD – a type of dementia)… read more about that HERE. Now, AD, a type of dementia, involves the external part of the brain (the wrinkly part! ), including the neocortex, and typically presents with memory/learning problems. This is different than cognitive changes that occur in PD. The basal ganglia part of the brain (subcortical – inner part of brain!) is affected in PD. The basal ganglia is not just involved in coordinated movement, but a junction site for some cognitive processing. So, cognitive changes in PD are a bit different – it may includes difficulty learning something, but memory of the material is retained. Cognitive changes include slowness of thought, insight, mental flexibility, attention/focus (vigilance). This is where cueing is helpful to retrieve information and for timing. We also see changes in “executive function” in PD, which basically monitors other processes; it is higher cognitive functioning that controls how we interact in the world (timing, appropriate behaviour, sequencing, tasking). … does that start to clear these terms up? This is my current area of research focus… specifically the impact of these cognitive changes on caregivers, so lots more to come on this! much love. Thanks,Kaitlyn. I am very interested in this subject since it is something we are dealing with on a daily basis. I look forward to more information from you. Yes Patty, I plan to be in touch in the coming week! May I reblog this Kaitlyn + share on FB? Brilliant! Of course! Please spread the word! Oh I didn’t know you were having back surgery … Hope everything went well and wishing you a fast recovery! See you Feb 10? Reblogged this on Barbara's Babblings. Your blog posts have really been kicked up a notch! Thanks for bringing us even better information. Thanks Rachel! So nice to hear! Hi – just wondering if anyone has any experiences of a specific type of hallucination / delusion with someone suffering from PD. A lady I currently care for is in her 60’s and transferred to long-term residential care last year because she lacked confidence and no longer wanted to remain in her own home. She had previously suffered from severe and very distressing hallucinations which included her thinking parts of her home and furniture was on fire. At its worst, she believed she herself was on fire and as a result, was taken to hospital and placed on PICU for a short period of time. Last summer she was fitted with the “APO-go Pump” and appeared to be doing well but this last month or so, she’s started with the hallucinations again, all of which include fires and the the belief that she is on fire. It started off as infrequent, mild bouts but has increasingly worsened. The specialist Parkinson’s nurses are aware and have asked for a review of her meds etc but I’m fascinated by this specific hallucination involving fire and wondered whether it’s just unique to her or whether other patients have reported similar? We can “talk her down” if you will when she’s getting particularly distressed and have realised that by sitting with her, talking to her and asking her to try and touch the fire she believes is right in front of her, the hallucination will disappear but I do wonder whether she might reach the stage where this is no longer possible. My father and mother have both had Parkinson’s; Mom is in a nursing home and is very incapacitated though in a wonderful place. It helps to realize Parkinson’s affects emotional balance, as Mom is often prone to depression now. Do you recommend coconut oil as a preventive measure? I have yet to read any convincing scientific evidence supporting coconut oil in Parkinson’s. I know there was some work around cognition in Alzheimer’s, but I’m not aware if the study was conclusive. Thanks. I recently participated in a university study of coconut oil; results are not in yet. The study is mainly looking at impacts on weight, diet, and general outlook. I have read studies linking CO to Parkinsons and Alzheimers, but they generally conclude it takes some 7 Tablespoons per day to be helpful. Coconut oil makes terrific french fries!